Billy George Drennan, 89, of the Dickens area, one of the real “working” cowboys of the Caprock foothills and wagon boss for the Pitchfork Ranch for 31 years, left this world on Thursday, August 2, 2018, greeted by his Lord and Savior, Jesus Christ. Billy George Drennan was born in Dickens County on a farm a mile south of Dickens and has lived in the county all of his life except for the two years while he was in the Army. He graduated from Dickens High School in 1947. At the age of 13 he began working at the nearby Swenson Ranch when not in school, in hopes cowboying would keep him out of the cotton patch. 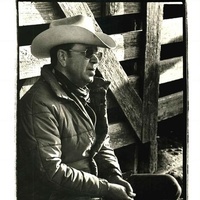 At the age of 15, he began working at the Pitchfork Ranch and worked there 44 years, the last 31 years as Wagon Boss. He was honorably discharged from U.S. Army in 1952. He married Sharlene Fitzgerald in 1953, and raised three children on the ranch: Steve, Becky and Shelly. Billy George Drennan not only raised his children, he raised quite a number of cowboys and their families. His strong faith, strong sense of responsibility, and steadfast decision-making ability has guided just about anyone having the opportunity to spend some time in his presence. Billy George Drennan’s servant heart was most exemplified by his faithful service and devotion to the works of the brotherhood of the Freemasons. After retiring from the Pitchforks, he sold some bar-b-que then was elected as a Dickens County Commissioner in 1994. He enjoyed his time serving the county and community of Dickens. He has been documented in countless magazines, books, and newspapers. He even made a Marlboro commercial. He has received awards, honors, and accolades throughout his lifetime, but his proudest moments and highlights of his life were his wife, that he adored and thought was the most beautiful woman he had ever met, his children, grandchildren, great-grandchildren. He never missed an opportunity to give direction, followed by expressions of love and pride in the family he created. He lived a good, long life. Not one moment would he have wanted to change. He has been released from his earthly aches and pains and has saddled up ol’ Blue and Forko, riding the biggest range imagined, with those who made it there before him. He was preceded in death by his father: Walter “Doc” Drennan; mother: Lola Belle Henson Drennan; brothers: Voil Drennan, Troy Drennan, Vernon Drennan, Coy Drennan, Claude Drennan; sisters: Mable Drennan Shaw, Ozella Drennan Box, Ella Mae Drennan Sims. Survivors include his wife, Sharlene Fitzgerald Drennan, son, Steve Drennan (wife Donna Drennan), daughters: Becky Drennan Gibson (husband Roy Gibson), and Shelly Drennan Marshall (husband Kevin Marshall), grandchildren: Stefanie Moseley (husband Jason Moseley), Amanda Lehman (husband Travis Lehman), Ty Gibson (wife Jennifer Gibson), Kelsay Marshall, Dillon Marshall, Wyatt Marshall (wife Brittany Marshall), Stonii Horton, and Koki Horton, great-grandchildren: Bekah Moseley, Kaden Moseley, Ace Ericsson, Garrett Moseley, Georgia Ericsson, Milli Holly, Trista Lehman, Austin Lehman, Brynlee Gibson, and a host of nieces and nephews. Funeral services - 10:00 A.M. Tuesday August 7th at the United Methodist Church (528 Burlington Ave, in Spur TX.) with Billy Paul Vinson officiating followed by interment at the Dickens, TX Cemetery. Fellowship with Family and friends at the Senior Citizens after burial. FELLOWSHIP WITH FAMILY AND FRIENDS AT SENIOR CITIZENS FOLLOWING BURIAL.